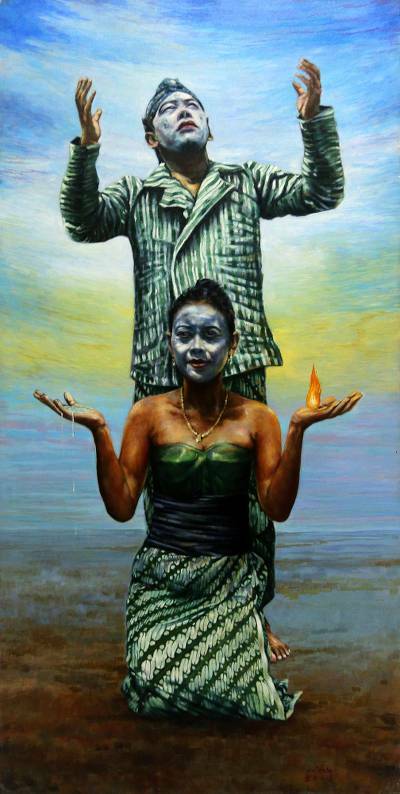 Signed Surrealist Husband and Wife Painting from Java (2011), "Husband and Wife as One"
Wearing traditional Javanese clothing, a husband and wife are portrayed as one in this painting by Yuli. He works in a surrealist style, capturing his subjects with excellent detail and dramatic lighting. The husband raises his hands towards the sky while the wife commands water and fire in her open hands. Says Yuli, "In a Javanese family, the role of a man is as a leader or as supporter, a woman as his backbone, and children as passengers; all as one team."